This is a nice medieval gold gilded bronze brooch, dating to the 13th - 14th century AD. It is of a lozenge shape, decorated with clusters of grapes to the sides. The pin is intact, slender so more suites to delicate silks or linen fabrics. 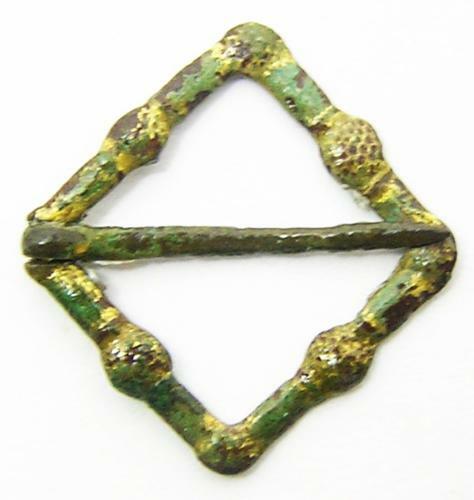 Similar lozenge brooches have been recorded in gold KENT-2AF116, silver YORYM-C37CB2 and bronze SF-62DD14. Ring-brooches are the most common type medieval brooch to survive and had a practical function: to fasten tunics, especially at the neck. Shaped as rings, with a long central pin, these brooches varied enormously in size and could be tiny, smaller than a fingernail. Ring-brooches were made of costly gold or silver, or of much cheaper copper or pewter. They were worn mostly until the late fourteenth century when changing fashions in dress included more closely tailored clothes and the growing use of button fastenings. This example has survived in excellent condition, the original finder appears to have coated the brooch with a thin layer of laquer to protect the patina.